The painter depicted a small town. It is an incredibly clear frosty day. In the foreground we see a janitor who sweeps snow. On the left are racing sleighs. The viewer feels the breath of the Russian winter and the burning of naughty frost. 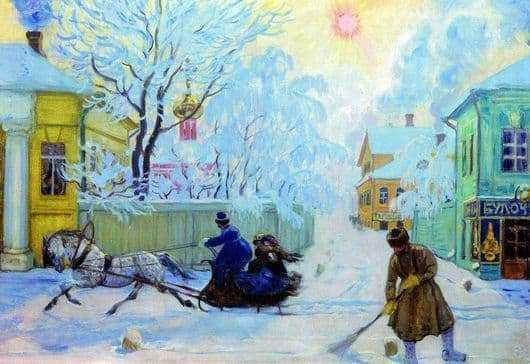 That is the way of life of the Russian, which Kustodiev portrayed with incredible skill. Kustodiyev very often depicted merry holiday celebrations. His favorite themes are festivals, fairs and various holidays. The artist loves the traditions of the people, in their search he constantly appeals to the peasantry and merchants. He loved to portray the province. This picture is no exception. Kustodiyev loved Russia. He absolutely did not care whether she was calm or restless. The past of the country attracted him with great force, but it was he who incredibly vividly responded to all the events of our time. The artist used on the picture incredibly bright colors. Sometimes it even seems that they are slightly unnatural. The spectator does not just see, he practically perceives this sunny day characteristic of winter. How rich is the palette of such a frosty day. This canvas creates the most joyful mood. In a seemingly enough everyday picture, many truly magnificent are hidden. To see it, you need to be a real master. But even greater skill must be possessed in order not only to capture it in the picture, but also to convey the general mood and design to the audience. The picture is not just static. We feel its extraordinary dynamism. It is this movement that transmits the troika, which fervently rushes down the street of a small winter town. Kustodiev has nothing accidental. Every detail in his picture does not just carry a huge semantic load. It helps to understand the whole idea of ​​this magnificent picture. It is from small details that the charm of winter nature is formed.